Ideal for home theater, DSS receivers, S-video VCRs, camcorders and DVD players. Connects two S-Video display such as monitors, television or projectors to one computer with S-Video female port or vice versa. Ideal for presentations, conferences and training purposes. Connects any digital camcorder, S-VHS VCR; DVD, satellite receiver or computer with S-Video port to composite RCA port such as switches, VHS or television. Ideal to connect specialized equipment, DSS (satellite signal), video, etc. Ideal to extending your existing cable. Ideal to connect specialized equipment, DSS (satellite signal), video, etc. Suitable for home theater, DSS receivers, VCRs; DVRs/PVRs, camcorders and DVD players. Convert your PC or laptop's video output into an S-Video or RCA video output for your TV with this 12-inch VGA to S-Video and RCA Adapter Cable. DVD TV Card to S-Video; Recorder and Digital still Camera Cables. 6 inches DVD TV Card to S-VideoRecorder and Digital Still Camera Cable. S-Video cables provide better quality picture than RCA composite but lower than component and HDMI. It is used in high end VCR, Security systems, Cable/Satellite boxes, and DVD players. These cables come with S-Video to S-Video, BNC, and RCA connections. We have a large collection of S-Video Cables including RCA stereo audio cable, extension cable, RCA cable gold plated and many more. All these cables are environment friendly and available in different sizes. You can buy the right cables suitable for your needs. 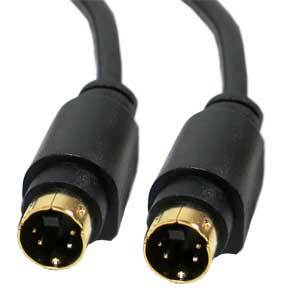 We provide 100% customer satisfaction when it comes to providing audio - video cables at the lowest prices. We source our cables directly from ISO 9001:2000 certified manufacturers and thus are able to offer our products at wholesale prices. And we don’t have any minimum order quantity requirements.